Home Featured Politics A Sacrifice For Our New Political Order By Dr. Obiageli Oby Ezekwesili. 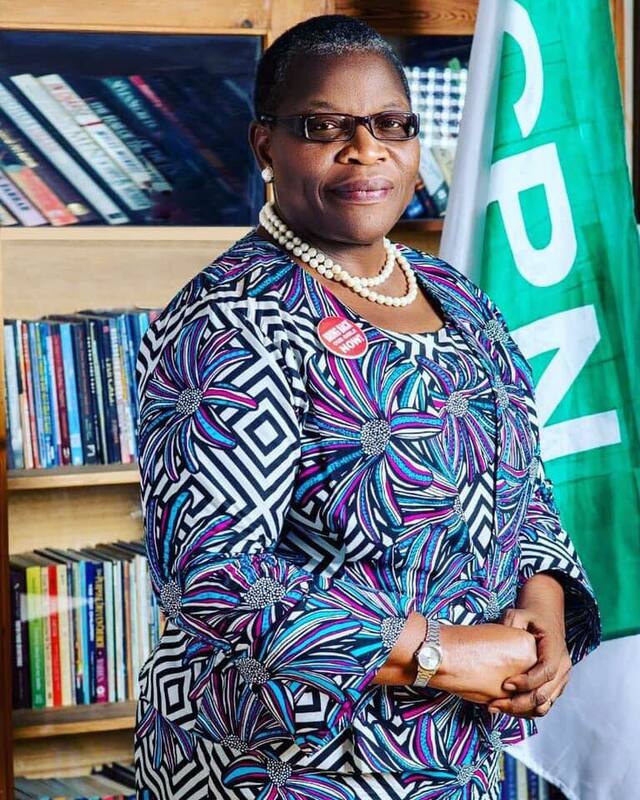 A Sacrifice For Our New Political Order By Dr. Obiageli Oby Ezekwesili. It has been an interesting one week since I made the tough but necessary decision to suspend my campaign for the presidency. I have been truly overwhelmed by the reactions to my announcement from Nigerians. Even in airports outside the country as I travelled last week, Nigerians walked up to me with questions, concerns, encouragement, and motivation. I also saw disappointment by some who had poured their hearts and hopes into actualising our mission to #Fight4Naija, bring back hope to our land and lift 80 million fellow citizens out of extreme poverty. I ask for the forgiveness and understanding of all who are hurt by my withdrawal from the race even as I take comfort in the fact that they would agree with my choosing to stand with my values rather than compromise. I am thankful to all who travelled on this journey with me, who attended our campaign events, who volunteered for the movement, who spread the word and sometimes argued with friends and colleagues, who contributed and invested online and offline. Thank you to the young people who accepted and owned our campaign, to the women – my sisters and comrades – who worked and walked with me, to every believer and supporter from different tribes, states, religions and walks of life. You all are champions. Your sacrifices continue to humble and inspire me and I will never ever forget. DEBUNKING THE LIES AND FALSEHOODS. I am sure you’ve all heard some insinuations and allegations since my announcement of withdrawal from the presidential race. My motives have been questioned with various versions of falsehoods being spread. I want you all fellow Nigerians to know that those allegations are alien to my character and pedigree. The lies were cooked up by the perpetrators themselves in a deliberate hostile attack of my stance against bad politics and governance. Let me reiterate that the #CitizensFirst campaign I ran was a serious one to which I was wholeheartedly committed. Millions of our citizens who followed our campaign on multiple platforms across the country can attest that we ran a promising campaign uniquely designed to be disruptive. We adopted a decentralized messaging strategy for maximum reach and impact. Our campaign was also appreciated by citizens for being empowering of the voters in contrast to the traditional campaigns that rob the largely poor electorate of their dignity. I have never been one to go into a new venture without first measuring the odds, counting the cost or taking stock. My candidacy was no different. Even though I was the latest to throw my hat in the ring, the campaign was not slack because we believed in the power of Nigerians to take their destiny in their own hands. It was a testament to our hard work in such a short time that whenever top candidates in the race were mentioned, my candidacy was always highlighted after those of the two-in-one dominant parties which make up the old political class in the country. We took our hopeful message to across Nigeria and created a unique retail driven campaign that resonated with Nigerians. One of the more laughable moments of the past week was hearing allegations that my presidential candidacy was a scheme to negotiate for a ministerial role. This is the height of political comedy, I must say. In their mischief and desperation, they sought to blemish one of the finest and dearest of young people who gave his talent, time and treasure for my candidacy – the prodigiously talented Iyin Aboyeji. I am eternally indebted to Iyin for his brilliance and for the deep commitment that he brought to my presidential campaign. Here are the facts that speak for themselves. Since I resigned as a cabinet minister in 2007, it is known that I have declined offers by different governments to serve as a minister again. Why would I then go through the pains of launching a presidential campaign to negotiate for a role I last occupied twelve years ago and have thrice rejected since after? Such mud-raking tactics is the reason why our best minds abstain from offering themselves up for political office thus leaving the worst of us to lead the rest. It won’t and can never stop me. It must not stop anyone of you who have watched the saga of the last week seeking to blemish me. It is in fact precisely why we must double down on disrupting this decadent “old order politics as usual” in Nigeria. More hilarious was the accusation that I raised and looted campaign donations. It is only morally bankrupt politics that can make anyone even imagine such accusation against me. I am not saying that I am above public scrutiny – no one is, but surely reasonable persons can see through the baselessness of these allegations. My absolute dedication to public accountability is widely known and no matter how much we had hoped to raise as campaign support from the public we designed an accounting system to go beyond the basic minimum of accountability required by the Electoral Act. For example, the accounting function and system was separate from my candidacy. It was independently managed for the campaign as you saw from the presentation just made by my Campaign Council. You could see the transparent details on what I contributed as a candidate, what we received as support from our fellow citizens and spent in the course of the campaign. What is appalling is the dull, deliberate, diversionary attempt by the leadership of the Allied Congress Party of Nigeria (ACPN) to slander me. As an official of government of Nigeria, I took a 90 per cent salary cut in order to serve this great country. I left government with my integrity intact and my name untainted. In all my years in the public, private, or development sector, there has never been any allegation of corruption against me. Not one. I have stayed true and consistent to my values – in private and public. If I remained incorruptible in government, would it not be senseless and cruel for me to suddenly be the kind of person that would divert funds and donations received from well-meaning Nigerians who believed enough in our vision for the country’s future to contribute financially to my campaign? Some of our supporters gave us as little as N500 and etched themselves for eternal gratitude in my heart. Do not believe those vicious lies. Your support was part of why our campaign forced issues-based discussions in the presidential contest. Please be proud of what you helped us accomplish. So, WHO IS OBY EZEKWESILI? One of the things I am most proud of is the fact that I have dedicated most of my adult life for the good of our country and fellow citizens. In the early 90s as a young professional working in the private sector, I was already globally reputed as a co-founder and one of the pioneer global directors of the anti-corruption body, Transparency International in Berlin Germany. Around that same period, I joined forces with other pro-democracy activists to fight against military rule and advocate for return to democracy through restoration of the stolen mandate of MKO Abiola at home and later abroad at the TI in Berlin before setting out for the United States. I returned to Nigeria at the end of 2000 to pioneer the reform of the broken Nigeria public contracting system by initiating and executing the Due Process unit and led the team that prepared the Bill that institutionalized it as the Bureau for Public Procurement Act. In that role, I was the lead architect of the design and implementation of the law and institution of the Nigeria Extractive Industries Transparency Initiative- NEITI. My track record as former Minister of Solid Minerals who pushed the reform that led to completion of our first ever postcolonial total airborne geophysical survey and armed us with data on the classes and locations of minerals across the country; and as a reforming former Minister of Education, are there for all to see. As a former Vice President of the World Bank, several African President and heads of government averred that I helped them reshape their mindset and understanding toward economic development of their countries by leading a team that provided the right partnership, knowledge and finance to support sound visions. I served as the Senior Economic Advisor of the Open Society Foundation, directly supporting a number of Presidents and their cabinets in identifying and designing the soundest policies for inclusive growth in their countries. Two of such Presidents are female and both of them publicly endorsed my presidential bid. As an active citizen, I marched on the streets of Abuja with other concerned Nigerians to awaken our government and the rest of the world to the sad tragedy of abduction of the 219 secondary school girls of Chibok, Borno State and the terrorist overrunning of the North East of Nigeria. I embarked on a solo-March to protest the barbaric killings of our fellow citizens in the Benue, Plateau, Nasarawa, Zamfara, Taraba, Kaduna, Enugu, Ebonyi and other parts of the country. I have never failed to confront any irresponsible actions of leadership and poor governance regardless of who the victim or their oppressors are including when I was in government. My mantra has always been that we who have had the privilege of education must use and raise our voice on behalf of those who are weak and vulnerable. In whatever context I am known in our country my joy is that none of it was for ill against Nigeria and Nigerians. Some among our citizens who attacked me – and still do – for advocating for ChibokGirls and Dapchi Girls – especially Leah Sharibu who was left behind when the rest were retrieved by the Federal Government, have failed to realize how important the biblical injunction in Psalms 82:3-4 is for me in all my efforts to advance Good Governance. “Defend the poor and fatherless,” the scripture says. “Do justice to the afflicted and needy. Deliver the poor and needy: rid them out of the hand of the wicked.” Good Governance matters most for the poor and needy amongst us. Those of us who have had the privilege of being lifted out of poverty surely must know this. It is the reason I am ever zealous to be on the side of demand for Good Governance. WHY I MADE A LAST-MINUTE ENTRY INTO THE RACE. Those who supported my candidacy are most likely those who share my dreams and vision for a new Nigeria. Those dreams and vision are valid as a famous daughter of Africa once said. Don’t let anyone tell you otherwise. Our mission to uproot the decadent #APCPDP political class and their upcoming wannabes and replace them with new order leadership is worth fighting for. The ultimate trigger for my launching a presidential bid was the consternation that once again our citizens were locked in with two candidates of those two dominant parties and were ruefully preparing themselves to “vote for the lesser of the two evils” in the 2019 elections. Such expressed helplessness by Nigerians that our country must resign itself to inability to produce a credible alternative to these candidates fueled my zeal to challenge the failed status quo politics and candidates. Although I have now had to suspend my campaign for the presidency, I will never suspend the fight for our out-of-school children (whose number actually once reduced during my time in the education sector) or for our young people who have no jobs. I will never suspend the fight for our fellow citizens terrorized and abducted by Boko Haram or senselessly killed by herdsmen, the millions who are one sickness or one poor harvest away from falling into poverty or the 87 million who are already stuck in extreme poverty and because of whom our country is now the world capital of poverty. I ran for office because of the poorest amongst us, whose plight were not getting the urgent policy response that could lift them out of poverty to live dignified and prosperous lives. I ran because whereas handouts can be gap-fillers, the more lasting way to lift people out of poverty is to take difficult and bold economic policy decisions that get to the roots of a country’s structure and enables shared and inclusive broad based growth. Consider that more than 1500 of our fellow citizens were estimated to have been senselessly killed last year by herders and terrorists with no justice for them and no consequence to their killers. Consider the mass exodus of our citizens to other lands, with countless young people dying daily on dangerous routes to Europe. Faced between the option of staying alive in Nigeria and taking a chance in the desert or high seas at the risk of death, our young ones are choosing to take the risk. Our trained professionals are migrating in droves to Canada such that a bank executive told me that he lost 25 of his best staff within a month. Consider the deep budgetary and debt crisis best revealed by the published 2017 budget performance of the Federal Government which shows that our total oil revenue is no longer sufficient to meet the salaries and wages of public servants. Do you see how dire the situation is? Those are the issues that motivated me to throw my hat in the ring. I contested for the presidency because of my belief that there is a better way; because I am convinced that all Nigerians deserve equal opportunities to be the best they could possibly be, no matter their background. I contested because I understood the urgency of a surgical rescue of our beloved country from further descent into economic, social and political failure. It is why the core philosophy of my presidential race was to place our citizens at the center of our Economic Development agenda. Until that vision is achieved, Oby Ezekwesili will not rest. I will continue to make my voice heard, and I will help amplify the voices of those being suppressed by the failures of our political class. My sleeves are rolled up and this #Fight4Naija is not about to stop now. Let me take a moment to address what appears to be an error of judgement that made me run on the platform of the quality of people that ACPN turned out to harbor. As you know, until I decided to run for President last October, I was not a politician but strictly a public policy expert. I have always believed that the brand of politics we practice in this country is perverse and unappealing to me. A series of deeply agitating occurrences moved me to take a keener interest in the toxic effect bad politics has on governance of Nigeria. Most of 2018 saw me increasingly mobilizing citizens to become more politically conscious and pay deeper attention to the activities of our politicians nationwide. I preached that to correct the prevalent bad governance for which Nigeria is globally derided, our citizens would need to take collective actions that terminate bad politics. Evidence abounds that our version of Politics undermines everything that we do in this country, whether it is what citizens do, what businesses do, what the society at large does. it undermines governance. When the ACPN leadership approached me in a series of visits to appeal that I run for office on their platform, the party appeared to be a good fit. It was founded by some disgruntled PDP members some years ago, but when its prime founder decided to return to the PDP, a core of its membership refused to move back with him. I was told that they stayed back because of their opposition to the ways of the PDP. Considering my vocal disapproval of the PDP and the APC, I admired the ACPN’s decision to stand firm and refusal to be co-opted. Also, the party came fourth in the popular votes count for the 2015 elections. So this was not exactly a mushroom party. We held several meetings before I chose to run on the ACPN platform, and in each of those meetings, I was clear to all that if the target was the same transactional money-grabbing politics that has held us back, I would never go along with it. My public stance that the nomination form for Presidency should not be above N100,000 was acceded to by the Party while they pressed me to join their fold. I also privately and publicly during the convention that adopted me as their presidential candidate disclosed that there was no personal war-chest for politics available to me and called on the Party to get ready for all of us to disrupt the traditional way of campaigning by the dominant parties. You may have seen some of the videos from those early meetings. You would notice that they repeatedly assured me that we shared common values and principles. We shook hands and made it formal. I knew that along the way I will face tests of my values, but I didn’t expect it so soon and not from the party members who had assured me privately and publicly that they were on the same page with me. In truth, our values were poles apart. The ACPN leadership demonstrated in deeds that they did not believe in my advocacy for a cleaner politics. They were not really interested in being a vehicle to break the bad politics championed by the #APCPDP. In fact, the ACPN leadership began to act like a junior sibling to the twin #APCPDP party. At one point, we were supposed to have a meeting with all the state coordinators of the party. Instead of the ACPN leadership to be honest about the strengths of the party and explain that some states did not have coordinators at the time, they hired fake coordinators, and asked the campaign to fly them into Abuja. You all saw how they demonstrated their preferred brand of politics last week by endorsing the ruling APC in a classic summersault. Deceptive politics of transactions at its worst! Their actions last week did not surprise me one bit. My relationship with the ACPN became problematic once they faced the reality of my modest financial means that I had transparently disclosed to them from the beginning. Their mistake was that they harbored two wrong assumptions about me. First, they assumed that I was one of those who served in government and had a stash of looted public funds hidden somewhere to expend on the elections. When they realized that was not the case, they made a second wrong assumption by believing that I would be willing to go and obtain foreign cash to prosecute my campaign. The leadership of the Party became frustrated that I was not using my global network to get “some countries, organizations and foreigners to donate money to their Party like the APC and PDP do. The more I told them that I was committed to abide strictly to the provisions of the Electoral Act and INEC rules on campaign finance and was not going to negotiate that in order to satisfy their monetary demands, the more frustrated they became. Ladies and gentlemen, in all these, the options before me were clear. I could give in to the ACPN’s desperation and use any means necessary to satisfy those fellows or I could uphold my values and leave their fold. I could succumb to their pressure, pretend as though I did not see how utterly corrupt their ransom demands were and continue with the campaign or I could step up at great personal cost to myself, and say ENOUGH. Immediately I expressed my options in those clear terms, the choice was easy. I cannot do anything that contradicts my eternal values. For someone who was running for office with a promise to fix our politics, getting mired in the mud of transactional anti-people politics would have represented a quick fall. God forbid! I had to live my values; I had to follow my truth. And I am proud I did. The only thing I now owe the ACPN is a total and immediate separation from their camp. I have earlier today returned my ACPN membership card, party flag and other paraphernalia in order to signpost my complete separation. INEC’s POSITION ON MY WITHDRAWAL. I acknowledge INEC’s position on the withdrawal of my candidacy. Based on the Electoral Act, the time has elapsed for withdrawal so the law still sees me as a presidential candidate. However, I have suspended my campaign and INEC’s position on my candidacy will have little effect. I will work hard to ensure that those who would have voted for me, cast their votes instead for the consensus candidate who will hopefully emerge from the coalition of willing credible alternatives in the coming days. My lawyers have officially written to INEC in a symbolic gesture to make them aware of my separation from ACPN. This entire process has been a great learning experience for me. I have confirmed some of the theoretical beliefs I held about the political process in Nigeria, and in some cases I have emerged with a newer, fuller understanding. I have come face to face with these political entrepreneurs who run the political industrial complex that has held this nation down for far too long, and I have experienced their deviousness at work. Bad politics is not limited to the two dominant failed parties at all; its tentacles have dug deep into most other parties where an old order mindset still reigns. There are many issues for which we must have important national conversations around if we are to make progress as a people. Things like the weaponization of political corruption by incumbents using state institutions. Things like upturning the undemocratic custom of regional zoning of candidacy. Things like what should be the optimal number of political parties in the country, how to ensure internal democracy in the parties and issues around political party reforms and funding. We have not given critical attention to the role of Political Parties not just in our elections but in the emergence of a new mindset in our Polity and wider society. Even among the newly registered parties, there are many in the image of the old order. We must start by building new parties on the set of new values we wish to see dominate our political landscape going forward. Rebalancing the mindset that dominates our political landscape would require massive entry into politics by those with the sets of dominant Values that can overrun and upturn the current predatory mindset of the Old Order political class. What our Politics most needs now and into 2023, is an army of values-anchored Nigerians committed to collective action and building the social structures for a New Nigeria of our dream. It does not require more than .5% of our population to achieve this. After all the number of politicians in our corrosive political system that cause Nigeria’s daily deterioration and decline are not up to that number. Can we find from among our population of 190 million, a little less than 1 million people with the mix of character, competence and capacity to lead at different levels and are prepared to become our new political class? I honestly think we can. It is a lesson worthy of my three months presidential race. We must have important national conversations on a public campaign financing model that will remove barriers for young people and women. As citizens we must talk about why there seems to be an appetite for a new order in our politics and governance, but an unwillingness to walk and work towards achieving our desires. In the coming months and years, I am committed to be right in the mix of these conversations, working hard to build a more perfect republic. The journey ahead would be tough. There are some who may even interpret the rottenness of my experience in the ACPN as proof that there is no hope, that real change is impossible. We must not allow ourselves to give in to those claims. As always we have to pick ourselves up and press with hardwork and determination to build the nation of our dreams. LONG TIME ADVOCATE OF A GRAND COALITION. In the immediate term, the way to continue this fight for Nigeria is for a coalition of alternatives to come together and end the poverty escalating reign of the #APCPDP in two weeks. We have to ensure that come February 16th, it is not just the #APCPDP that will be on offer for Nigerians. I have always advocated for credible alternatives coming together to take on the failed ruling class. You may have seen videos online where I told ACPN leaders that a coalition with other parties was the best route in this election whether I end up as the consensus candidate or not. Last year as part of a Citizens’ movement, we held a Summit of the Alternatives (SOTA) in conjunction with six civil society organizations to set in motion the process to produce a credible alternative who will face off with the APCPDP. While that process was still ongoing, I got a call from a group of Presidential Aspirants Acting Together —PACT saying some of the candidates were working among themselves to arrive at a consensus. It was the candidate of the ANN, Fela Durotoye, who reached out to me and explained that they unanimously agreed that I should be the one to monitor the process based on rules they came up with themselves. It was not a convenient time due to an already scheduled trip, but I was convinced to do it because it was something I had always clamored for. The sad saga of PACT was most unfortunate and in turn became a contributory factor to my ultimate decision to enter the Presidential race. After I became a candidate, I submitted myself to several citizens’ led processes to arrive at a consensus from among the alternatives. Fellow candidates who attended those meetings would agree that I was always ready to sacrifice my candidacy for the common good if it came to it, as long as there was sincerity of purpose from all sides. Unfortunately, those meetings did not yield the desired end, for various reasons. I had to go through all that background to make the point that my stepping down to work for a consensus arrangement is not an afterthought. I’ve always believed in it. It is my sincere hope that the credible alternatives left in the race are willing to sacrifice for Nigeria’s common good which is a New Order of Politics of Character, Competence and Capacity. My immediate commitment is to help in any way possible to build this coalition. Since the suspension of my campaign, I have taken actions to reach out to six of the key alternative candidates and sought the involvement of one of our most respected elders in getting them to the place of sacrificial leadership required to ensure a workable consensus from among them. Citizens wish to see them make this sacrifice, and my sincere charge to the alternatives is to do all it takes to form a coalition of the willing with one strong candidate that will bear the mandate of those who seek good governance for Nigeria. For me, I will get some needed rest, and go back to my professional work. But as a citizen, I have two big priorities going forward. The first is FixPoliticsDotOrg, a values-based movement to disrupt our politics and reconstruct this country. In a way this is what I sought to achieve by joining politics in the first place. I realise that it would not be a quick fix, it is a marathon but the best time to set out is now. We must drive a citizens’ movement built from the bottom-up and which possesses a clear identifiable philosophy. You will hear more about our agenda soon. The second big priority for me is the establishment of a multi-partisan school of politics and governance; a leadership school that helps us grow a pipeline of leaders from the base. Nigeria has not been deliberate in raising the next generation of leaders as some other countries like South Africa has. We must change that, otherwise we would continue to repeat this cycle where there are not enough people with the character, competence and capacity taking over leadership from the council level to the assemblies and state houses, up to the presidency. 2023 must not find us only trying to make change happen from the presidential level. We have business schools like the Lagos Business School, being deliberate about growing business leaders; there is no reason why we cannot have an equivalent for political leadership. It can be done and we will do it. I ask all those who are disappointed that we could not go all the way this time in our quest not to lose faith. We will work hard together for the coalition candidate, whoever that might be, and afterwards, we would begin our long-run vision of building a massive political movement that will reflect the values we share together – the values of a new political order that has parties as solid organizations with clear values and philosophies. We have a lot to look forward to. Let us not dwell on what has passed or wallow in self-pity as though we have no hope. The future beckons and life is too short to dwell on what might have been when there is still so much that can be. I hope and pray that you all will support me in these efforts. To my supporters and fellow citizens who we met on this journey across different states, and who had already made up their minds to vote for me, I thank you most sincerely. To colleagues and allies who stood strong with me every step of the way, I appreciate your friendship and leadership. To my husband and my family, I could not have done this without you; your support means the world to me. To volunteers and self-sustaining Oby for President groups, donors, and my extraordinary executive team, who gave freely and willingly because of your belief in our vision and your love for country, thank you for working so selflessly. Some of your dropped work and other activities to commit fully to the campaign, travelling around the country with me, making big sacrifices… I feel so blessed that I could count on all your support. God bless you all mightily. This is now the time to match confidently towards the future knowing that we are not powerless; knowing that we have all it takes to effect the real, powerful change that this country desperately needs. This chapter may be closed, but our story is far from over. In life there is always a Third Way when the other Two Ways have core similarities that produce same undesirable outcomes no matter how many times you rotate your choice between them. Finding the Third Way may be hard. But, it is worth seeking diligently. And we shall surely find it. Thank you all. God bless you, and God bless the Federal Republic of Nigeria.